Thank you for the time you devote to being an Ascension Coach. The Athletic Association would not be able to field teams if we did not have dedicated people give their time to help the program. Remember that coaching an Ascension team is a privilege and a responsibility. We strive to afford the environment for our players to learn about the sport, but more importantly, to learn about Sportsmanship. In addition to teaching your players how to play a sport, you will also be helping each child develop a positive attitude about themselves, their teammates, referees, and coaches. As a coach you are a role model for both players and parents. While there is required training and background checks associated with being an Ascension coach, we hope you understand these requirements are put in place to protect the children and to ensure you, as a volunteer coach, understand your role and your responsibility to the children. PLEASE NOTE: ALL COACHES & ASSISTANT COACHES MUST REGISTER! There is no fee for this registration. There are five requirements for coaches that must be met in order to coach as Ascension. We realize fulfilling these requirements is an up-front time commitment for perspective coaches, but we need to ensure all our coaches have the proper training and background screening in order to provide a safe and positive experience for the children in the program. Each task is a one-time requirement for coaching any sport the Ascension Athletic Association. Attend "Protecting God's Children Training Class"
Sign the "Commitment to Ethical Conduct form"
Complete the Background Screening - "Worker Registration Form". All head coaches and assistant coaches of all teams are required to attend the "Protecting God’s Children" class. This class is offered at various parishes and locations throughout the St. Louis area. You can attend at any location. Download the Code of Ethical Conduct file from the documents on the right. Read the document, sign page 11, sign and date, and email to gstamer@ascensionchesterfield.org. All head coaches and all assistant coaches of all sports teams must complete and return to the Ascension rectory the Missouri Department of Health and Senior Services Family Care Safety Worker Registration form. Return the form to the rectory. Please note, if you choose to complete the form online, you still need to submit a copy to the rectory, so they may access the results. You only need to submit the form one time. However, Ascension will request the background check every even numbered year as long as you are coaching at Ascension. Any questions call Ginger at Rectory Office 636-532-3304 or email gstamer@ascensionchesterfield.org. All head and assistant coaches of all sports teams are required to complete the "Coaching to Make a Positive Difference" class. The class will take approximately 2.5 hours to complete. There is a $19.95 fee payable with a credit card or PayPal. Coaches, please be sure you have enabled SMS/Texting notifications on your account. 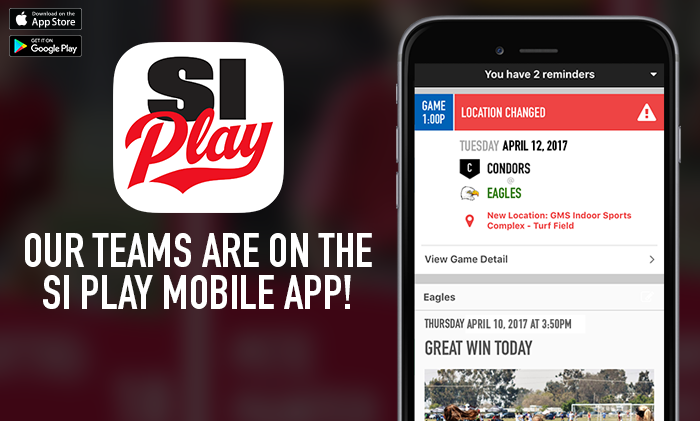 Also, you can download the Si Play app to make managing your team even easier! See the instructions below. Add events to your team calendar, view player availability, email your team, and more. Find detailed instructions in the Coach Users Guide. To get the app, click the link below from your mobile device or visit the App or Google Play Store.